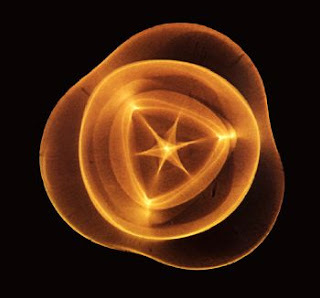 Cymatics is one of those curious phenomena that makes you open your mouth in wonder. I mean, all you have to do is watch and listen to the video below to see what I mean. Of course, you may be wondering what the study of visible sound and vibration has to do with singing and the Old Italian School. Ok then. Here's something to wrap your head around. Singers and teachers more often than not occupy themselves with shaping their bodies in order to make vowels and various tonal qualities. However, what if the reverse is true? That is, what happens if singers and teachers think in terms of the vowel/tonal quality shaping the body? To anticipate the "feel" of resonance (vowels) before singing, and to keep the sensation during pauses and after singing, is the lost art of the Golden Age of Song. From Vocal Wisdom: Maxims of Giovanni Battista Lamperti by William Earl Brown (1931). I've never forgotten the moment I was watching a video of a performance of a concert that had a quartet of excellent soloists standing in front of an amateur chorus. What caught my eye? The soloists had their heads screwed on differently. Guess who looked more aligned? A really beautifully resonant vowel/tonal quality commands the audience to listen. What happens if it also molds the body into the shape that produces it? For more on cymatics, see here and here. Being from an artistic profession of the visual arts, I have always viewed and experienced my own singing in a more visual way. When I sing a tone well, I have perceptions of various geometrical forms and how they combine and change trough out the range and interact and move trough space and found this always fascinating and was always interested if this was related to frequencies, the way it interacts with our bodies and where does this perception come from. Whenever I think about tones, I always think about shapes, lines, for me singing is a very visual and geometric experience. I might even say sculptural, as all this is in 3D. I also encountered something similar in a Sutherland-Horne interview where they both talked about how they experience their voice. And don't quote me now who said what, but I'm almost sure Horne talked about a triangle, and Sutherland about a squerical shape on high tones. I'm not sure now. But it's on the trace of this. Also, some (bad) teachers usually talk about a pear tone shape being the correct one. True to a point, although I wouldn't recommend it as a teaching tool. But I really think this is something what should be more documented and researched, because this is so interesting. I have quite a few problems accepting the modern music notation, description of how something should be performed or how it should sound. It's complex without a reason and not visual enough. (It could though be that only visual people want it to be more visual) Plus I don't think words and notation symbols are enough for this. Nor efficient for that matter. A Mahler symphony when just looked at trough notes and words (such as "allegro") can in every head be turned into so many different things. It happens with every conductor. With a line you can't go wrong. For me, personally, the most useful singing advice, well, the second most useful singing advice, comes from a very very old teacher from my country, from the really old generation and old school teaching who just said to all students to keep the tone "thin". If you start it thin, you can blossom it, but it always must be thin. And imagining thin geometrical patterns expanding to more complex ones was somewhere over there. It's not necessarily good to start in such abstract things. But said in the right moment can bring a lot and help with memorizing.